Tourist attractions pull millions of people to the countries that they are situated in every year. The attraction has to do with everything from their beauty or charm to who or what they represent. While most tourist attractions are kept pristine to ensure that generation upon generation will have the privilege of enjoying their essence, we have discovered five of the dirtiest attractions which still pull crowds for various reasons. Grauman’s Chinese Theater is a movie palace on the historic Hollywood Walk of Fame at 6925 Hollywood Boulevard in Hollywood, California, United States. The forecourt of the theatre is a popular destination for tourists as it bears the signatures, footprints, and handprints of celebrities from the 1920s to today. You can visit the forecourt of Grauman’s Chinese Theater and use your hands to measure the hand or feet sizes of your idol, but the question is, do you want to? The handprints and feet of numerous stars of world cinema were left in the wet concrete and millions of fans troop in to touch the resultant prints. Problem? No one ever does their disinfection, so if you must absolutely experience the feel of your idols concrete hands, try putting on a glove or washing your hands immediately after. This second dirtiest attraction on the list is the Blarney Stone, a block of Carboniferous limestone, built into the battlements of Blarney Castle, Blarney, Ireland. Tourists every year travel from far and wide to visit this castle and kiss the stone, which according to legend, will give the kisser the gift of eloquence and skill of flattery. For this reason, thousands of people desirous of eloquence and flattery touch lips to the stone, leaving behind billions of microbes. Also, kissing the stone demands a lot of physical exertion because of the angle it is placed. But anything for eloquence, I guess. The tomb of Oscar Wilde, a well known and very brilliant Irish poet and playwright, is another one of the dirtiest attractions. The tomb is located in Père Lachaise Cemetery, Paris, France. It is a popular tourist attraction for admirers of the writer who died in the year 1900. A huge monument in the form of a winged sphinx is located on his grave and has had the unique privilege of being adorned with many kisses. Book lovers and admirers express their love and respect by touching their lips to the monument leaving behind multiple lipstick prints. Parisian authorities in 2011, however, decided to build a glass fence around the monument and fans now leave traces on the glass as well as throw flowers and notes over the fence. The Patriarchal Cathedral Basilica of Saint Mark commonly known as Saint Mark’s Basilica is the cathedral church of the Roman Catholic Archdiocese of Venice, Italy. It is Venice’s most famous church and one of the best-known examples of Italo-Byzantine architecture. The church is a huge tourist attraction for its opulent design, gold ground mosaics, and its status as a symbol of Venetian wealth and power. It is a very beautiful place but has a bit of a negative which are the hundreds of hungry pigeons that fly over the heads of tourists. This may not sound so bad because pigeons are beautiful. Until they leave their droppings all over the place inclusive of your clothing and body. 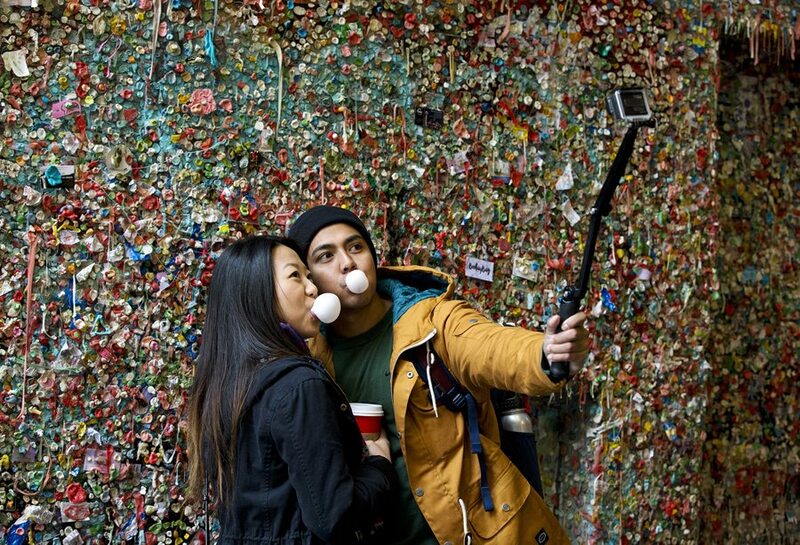 The Market Theater Gum Wall is a brick wall covered in used chewing gum, in an alleyway in downtown Seattle. This unhygienic attraction is said to have begun in the 90’s after theater-goers who needed to rid themselves of their gum while standing in line tacked them onto the wall. The wall had since turned to a field of gum which some view as one of the brightest Seattle points of interest, but others view as repulsive, today, however, you can see it as rounding out our list of dirtiest attractions. The wall was cleaned completely last year but people are attempting to take it back to its former state as gum continues to be tacked onto the wall.